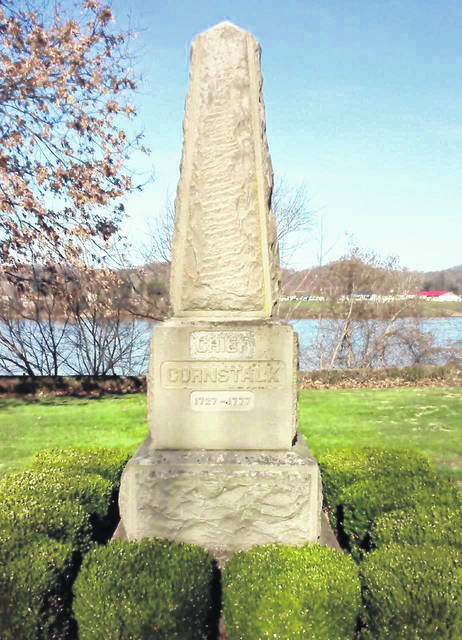 The final resting place and monument in honor of Chief Cornstalk at Tu-Endie-Wei State Park. Last week, we came to the end of the Beaver Wars. The Fort Ancients have been obliterated by the Iroquois Confederacy and European disease, namely smallpox. Other tribes, including the Delaware, Miami, and Shawnee, were driven from their homeland in all directions. This week, in the last part of the Native American History series, we trace their return home and eventual forced removal. It began soon after the end of the Beaver Wars, as the Iroquois retreated, and the various tribes realized that their land was once again free. However, many were skeptical, thinking that the Iroquois would return, and only small groups began returning to the Ohio Valley. Two of the first were the Ottawa, who settled in northern Ohio, and the Shawnee, who formed a small village at Lower Shawneetown near South Portsmouth, Kentucky. For years, these remained the only communities in the Ohio Valley. By the 1720s, as the English colonies on the East Coast and French colonies along the St. Lawrence River Valley expanded, the tribes that had fled to the north and east began to return to the valley. More Shawnee joined their kin at Lower Shawneetown, establishing it as something like a regional capital, and another branch of the same tribe settled at Logstown, near Pittsburgh, which became an important meeting place for various tribes and government officials until Fort Duquesne was built. By the 1740s, more tribes were being forced west by colonial expansion. Peter Chartier, leader of the Pekowi Shawnee Clan, moved his tribe to Lower Shawneetown in 1745 because the governor of Pennsylvania would not help keep traders selling alcohol out of his village. But by far, the largest migrations came in the 1750s. In 1753, those who were already at Lower Shawneetown sent runners to the extended Shawnee clans, urging their kin to come home and reclaim the strength that they once had. The first to heed this call were the Chalahgawtha Clan, one of the most powerful. The same year, they abandoned their towns at Cumberland (MD), Moorefield (WV), and Winchester (VA), which was the council seat of Cornstalk’s father. They were soon followed by the Hathawekela, Kispoko, and Mekoche Clans, who were scattered as far away as Alabama, Illinois, and Pennsylvania. By the 1760s, the entire tribe had returned to the valley, and a new capital, named Chillicothe, had been settled near the present-day city of the same name. As for the other tribes, the Delaware, who had been slowly forced west since the 1720s, notably by the infamous Walking Purchase of 1737 in which they were cheated out of their land by the Pennsylvania government, finally settled in the upper Ohio Valley. The Wyandotte, a combination of the surviving Huron, Petun, and Wendat from the Beaver Wars, returned to their ancestral lands in northern Ohio, where they were joined by the Mingo, an offshoot of the Seneca and Cayuga Iroquois nations that were fed up with French expansion. The Guyandotte, an offshoot of the Wyandotte, settled along the river of the same name just to our south. Ancients, who would’ve told them stories of the Hopewell and maybe even the Adena. Over hundreds of generations, these ancient mound builders became ancestor-like figures, and nobody wanted to disrespect their graves, especially those of the recently murdered Fort Ancients, by settling among the thousands of mounds that once dotted West Virginia. Even in Ohio, no new villages were settled near the ancient mounds at Wolf Plains or Buffington Island. Of course, this only made colonial expansion into the Ohio Valley in the 1770s that much worse. Add this to the fact that the Iroquois, who still claimed the Ohio Valley by right of conquest, sold the land out from under them, and there was bound to be a fight. And a fight there was, one that lasted nearly 80 years. Through the French and Indian War, Lord Dunmore’s War, the Revolution, and the War of 1812, the Native Americans of the Ohio Country fought tooth and nail to preserve their way of life, and many died for it. Massacre after massacre (Cornstalk’s murder, Broadhead’s Expedition, Gnadenhutten), the colonial and American armies, blinded by 18th-century racism, attack the wrong tribe and do nothing but drive the tribes further towards war. This only ends following the Treaties of Greenville and Fort Meigs in 1795 and 1817, which force the tribes to give up their lands. They are then forced to move west to Illinois, then Kansas, and finally Indian Territory, now Oklahoma, where many of their descendants now live. Information from the West Virginia Encyclopedia, Ohio History Central, and various other sources. The next meeting of the Mason County Historical and Preservation Society will be at 6:30 p.m.,Wednesday, Dec. 19 at the Mason County Library in Point Pleasant.